Early each morning, Leonidas Bulgarini and Elizabeth Foldi buy fresh fruit at the produce markets in downtown Los Angeles. They bring back cases of seasonal bounty, like blueberries, cantaloupe and white peaches, to their gelato shop in Pasadena. 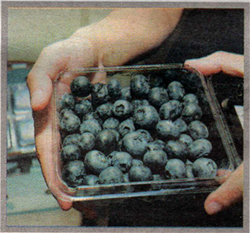 On a recent weekday, Bulgarini decided to make blueberry sorbetto (mirtillo). He washed the fruit, inspected each berry by hand and threw the rotten ones out. He pulled off the tiny stems, one by one. He blended the berries, then added the puree to a sugarwater solution and froze the mixture in a gelato machine for about 20 minutes. In the last few moments, he added a splash of moscato d’asti, an Italian dessert wine, to add dimension to the flavor. I scooped up the fat-free delight with a little shovel, and the bright, creamy flavor of blueberries burst in my mouth. The fruit in my dessert was only four hours old. 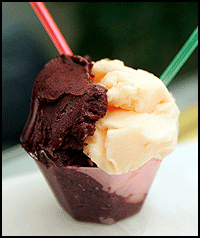 Handmade Italian ice cream is a rare treat, whether it is gelato (made with milk) or sorbetto (without milk). Before the couple opened their shop, Bulgarini was a manager and sommelier at Trattoria Tre Venezie, an upscale Italian restaurant in Pasadena. The Italian native grew up in Rome, and wears his hair in a long ponytail. He met Foldi when she walked in for dinner one night. His wife-to-be had worked as lawyer for several years, but was looking toward food as a new career. While Foldi is Chinese and Hungarian, she is also fluent in Italian. Bulgarini eventually won her over, and the pair traveled to his hometown together and stayed for a year. They wanted to learn how to make authentic gelato the old, artisan way, but couldn’t find anyone in the city who knew how. They finally found an octogenarian in Sicily who was a famed gelato maker. They arranged to meet the gelato master, who passed down his techniques to the couple. 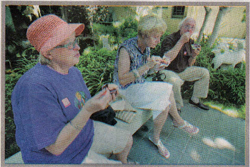 After they came back home, they opened their gelateria in April, just inside the Pacific Asia Museum in Old Pasadena. The pair makes traditional Italian favorites, as well as zen-inspired flavors like chocolate ginger, mandarin orange and lychee strawberry. Actually, most of the time, Bulgarini makes the gelato; Foldi is the taste tester. 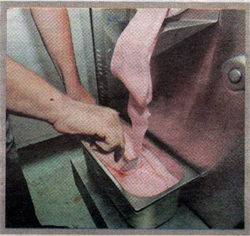 The basic method of making gelato starts with combining the base ingredients: milk, sugar, nonfat milk powder, and vanilla beans. After heating the mixture through, you add chocolate, espresso, fruit or nut paste. A popular flavor in Italy is zabaglione, which is flavored with marsala wine..
Bulgarini has his own little secrets to making his phenomenal Italian ice cream. He only uses all-natural ingredients and revealed that he lets the gelato mature a little longer in the freezer. All of the sorbettos are made with fresh seasonal produce. Sometimes Bulgarini will go to San Luis Obispo to find quality produce. He only uses organic milk in the gelatos, as well as quality ingredients like Madagascar vanilla beans, imported Sicilian pistachios from the volcanic region of Bronte, and hazelnuts from Piedmont. Making Italian ice cream from scratch is time-consuming, expensive, and takes a certain amount of skill. The fruits, proteins and sugars need to be balanced, Bulgarini said. A lot of things can go wrong, too: The finished product can develop ice crystals, or the flavor can be too rich or not sweet enough. Most gelato shops in the United States and even Italy have switched to pre-made bases and artificial flavors. People have forgotten traditional methods as they turn to packaged products, and the art of gelato making is dying, Bulgarini said. Bulgarini is also a sculptor and a welder, and he likes to create beautiful things from raw material. He has the same sentiments about gelato: making it by hand is more difficult, but worth it, he said. In the future, Bulgarini and Foldi want to make chocolate-dipped gelato, as well as sugar-free and lactose-free versions.